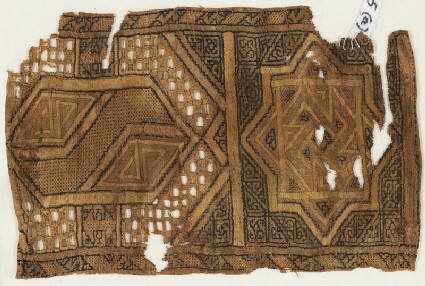 Originally decorating a sash or a shawl, this band is one of the finest examples of late Mamluk embroidery available in the Ashmolean Museum’s Newberry Collection. Combining different stitching techniques with sections of openwork, this accomplished embroidery suggests the work of a highy-experienced embroiderer. 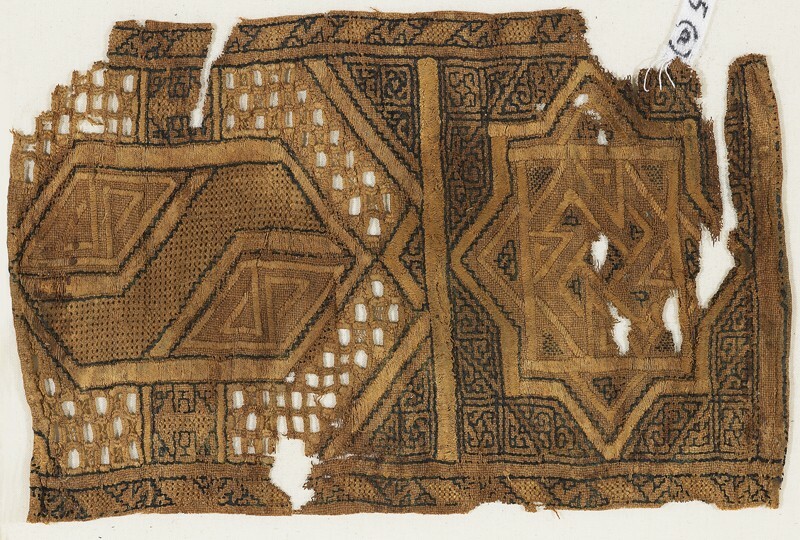 Such elaborate textiles were appreciated beyond the Islamic world. 15th and 16th-century Western paintings depict embroidery patterns similar to those used by the Fatimids and Mamluks , confirming Europe’s fascination with the sophisticated products of Muslim craftsmen which were by then available in major Western commercial centres. This is one of the finest examples of 15th century Mamluk embroidery, employing several different stitches including those producing areas of open work. It is one of three bands of embroidery worked on a scarf end measuring 17.5 cm across. This is broader than the more usual eleven centimetres or so of others in the collection. When this factor is taken in account together with the amount and intricacy of the embroidery, we can see that it must have been a very special item. Some of its splendour has been lost through wear, particularly the drawn-thread work areas: originally more of the large spaces were decorated with four tiny loops of yellow silk forming a stitch sometimes known as 'dove’s eye’. This is an important piece because its design of an eight-pointed star and a rectangle divided into geometric shapes appears on cloths in two late 15th century paintings of the Circumcision of Christ. The Venetian painter Marco Marziale (active 1493-1507) showed the Christ child sitting on a cushion placed on an embroidered cloth. In both cases Marziale painted all the textiles, including lavish costumes, in great detail so that on the embroideries even the tiny pairs of birds above the border can be seen clearly. The principal colours seen on those painted embroideries are the same blue and yellow as on the band fragment. It is clear that Mamluk embroidery of this type was admired in Venice to the extent that it was seen fitting for ecclesiastical furnishings and was presumably either being imported from Egypt or being imitated locally. A star embroidered in yellow satin stitch contains a rectangle with a four-armed angular spiral; it is set against a background of lozenges and triangles embroidered in blue double running stitch. Adjacent to it is a cartouche which contains a hexagon subdivided into a large S-shape and two lozenges. The designs are outlined in yellow satin stitch and blue double running stitch. The background of the cartouche is made up of drawn-thread work with overcast and loop stitch. The large S-shape and parts of the border is filled with pulled work with wrapping stitch in diagonal rows. There is a fine hem along two sides of the fragment. The related fragment of 1984.445c has been radiocarbon dated to 1395 +/- 40.